When it looked like the gas prices in the United States of America could not possibly get any worse than they already were, they got worse. In most sectors of the country, the average price for a gallon of gasoline has either passed four dollars or is nearing it. In some areas, like Death Valley, California, the price for one gallon of gasoline is already over five dollars. As a result, inflation rates have been affected. In March alone, inflation rates have risen more than they have in over a year. According to the Consumer Price Index and the United States Labor Department, the inflation rate rose 2.7% in March. The rise is the fastest since December 2009. Because of the rising costs of gas, oil, and as a result, food, the amount of money Americans spend on a daily basis is growing. Food and gas are two things that Americans use and buy all of the time. Thus, when prices rise and salaries do not, the percentage of money Americans must spend is growing while the percentage that they can keep for discretionary spending is dropping. In the last year, the price of gas has grown 27.5%. That includes a 5.6% increase in March alone when the majority of the problems we are seeing today were exacerbated. In comparison, food costs also rose over the last year with the biggest spikes being seen in March. Over the last twelve months, the average cost of food increased 2.9% with a 0.8% increase in March. President Barack Obama has been working hard to make sure that job creation is improving in the United States in an effort to improve the economy. However, the major problem now is stemming from the cost of two things we use every single day: gas and food. The trouble is that no reduction in costs is in sight. With gas prices going up everyday and essentially where they were during the peak of the Iraq War, the rumbling among Americans is growing as they demand something be done to lower the prices. While no improvements are in sight, we could never know for sure. 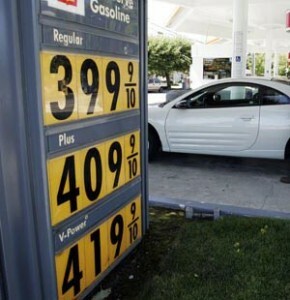 The coming weeks will show where exactly the economy is heading in terms of food and gas prices.